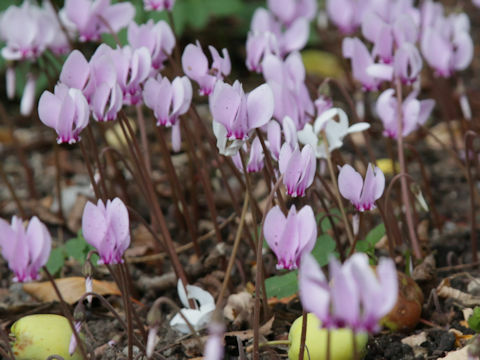 Puple cyclamen (Cyclamen purpurascens) belongs to the Primulaceae (the Primrose family). It is a perennial herb that is native to central Europe, northern Italy, and Slovenia. 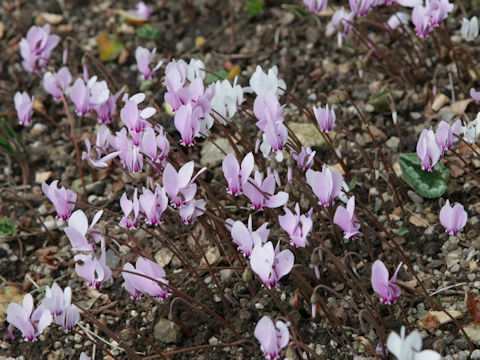 This herb grows in deciduous or mixed woodland, especially among beeches and over limestone, and up to a height of 10-15 cm. The rosepink to reddish purple flowers bloom from June to October. They are very fragrant with a sweet scent. The leaves are appear in late summer, sometimes with the old leaves still present. They are round or broadly ovate, edge smooth or slightly toothed, from plain dark green to all over silvered, through marbling in shades of green or silver, and underside purplish.